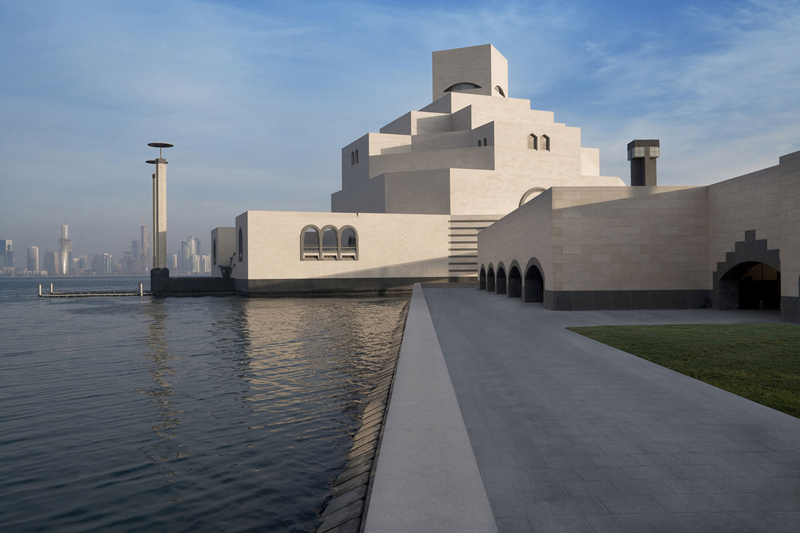 The Museum of Islamic Art (MIA) is a pioneering project spotlighting the cultural vision of the State of Qatar, both in the region and across the world. Under the guiding vision of His Excellency, Sheikh Hamad bin Khalifa Al Thani, the project is the cornerstone for the State of Qatar in its establishment as a global capital of culture. The 35,500 sq. m museum was designed by I.M. Pei, taking inspiration from the 13th-century sabil (ablutions fountain) of the 9th-century Mosque of Ahmad ibn Tulun in Cairo. The museum comprises a five-level main building and a two-storey Education Wing, connected across a fountain courtyard. The main building’s angular planes form ascending pinnacles, rising around an atrium. Inside, a dome is revealed, concealed from outside view by the walls of a central tower. A window on the building’s north side rises to a height of 54 m., providing dramatic views from all five floors. The ground floor is home to a temporary gallery space for touring international exhibitions and the café, giftshop and Information Services. The museum’s permanent exhibition is installed on two floors of galleries designed by the French firm Jean-Michel Wilmotte & Associés. The fourth floor contains temporary galleries showcasing the research topics of museum staff, using items either not seen in the permanent galleries or with new information to see them in a new way. 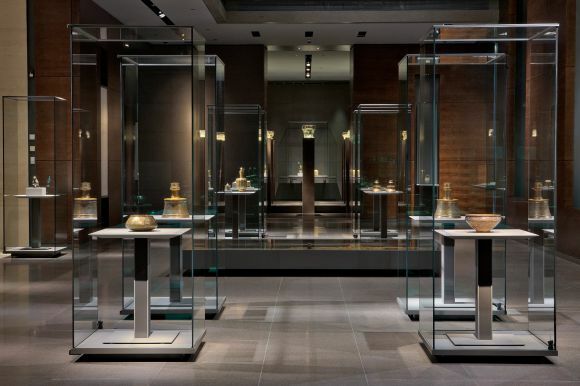 The MIA houses artefacts highlighting the creative achievements of the Islamic world's richest cultures and spanning nearly a thousand years. 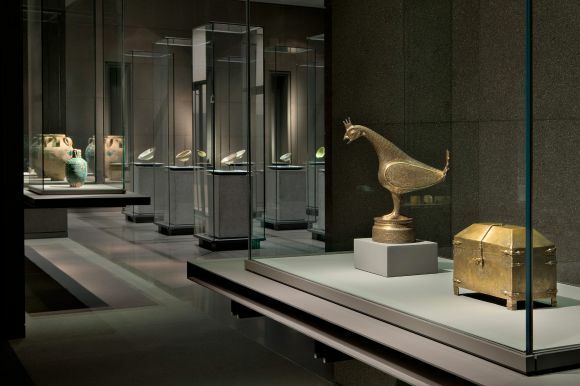 The collection represents the full scope of Islamic art in all media, from manuscripts to ceramics, metalwork, glass, stone, ivory, textiles, wood, precious stones and jewellery. The permanent exhibition of c. 850 artefacts offers an insight into the diverse art of the Islamic world. Two floors are dedicated to the exploration of historical eras and interpretation of the themes of Islamic art and material culture, from the 8th century to the cusp of the 19th century. The MIA also holds thousands more objects, some destined to be seen in future displays and others providing a resource for education and research. Highlights of the collection include: a distinguished group of carpets and textiles, a range of Ayyubid and Mamluk metalwork and enamelled glass, an outstanding strength in early ceramics, a comprehensive collection of astrolabes and scientific instruments, masterpieces of Mughal jewellery and rare manuscripts and miniatures. The department’s main goal is to create materials, programmes and workshops that will engage the public, allowing them to explore the world through Islamic art, promoting a culture of learning within an atmosphere of knowledge and entertainment. The department of internationally trained curators is committed to studying, documenting and publicising the MIA’s collection and establishing the MIA as a world-class centre of scholarly research. Set to become a leading regional service centre for museums, the department is committed to restoring, preserving and caring for the collection through the application of innovative scientific methods. The MIA is committed to building a network of partnerships around the world and offering institutes and museums collective access to information, research and images. It has strong ties with many world-class museums and collections, including the Louvre, France, the British Museum, UK, the Victoria & Albert Museum, UK, the Metropolitan Museum of Art, USA, the Museum für Islamische Kunst, Germany, the Al-Sabah Collection, Kuwait, the Gulbenkian, Portugal, and the National Museum of Antiquities and Islamic Art, Algeria.